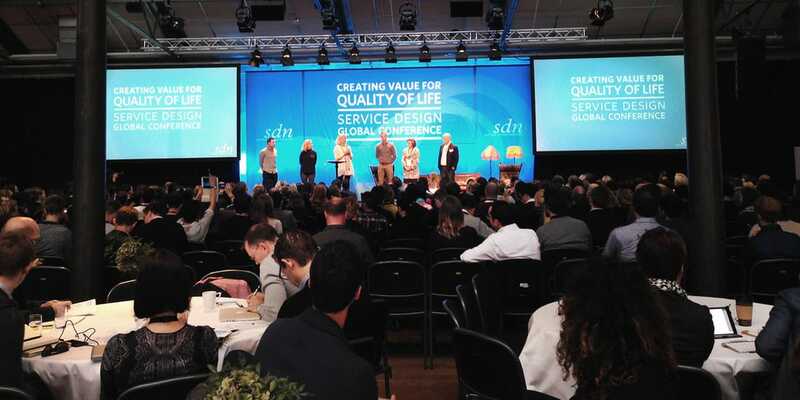 Curious, thinkers and doers that strive to “Create value for quality of life” – whatever it means for each of us –, met at the 7th edition of the Service Design Global Conference in Sweden. When asked about what does “quality of life” visually mean for each of the speakers, none showed an image of modern device. Nothing to do with technology, user research or science developments, but all, really all, dedicated their first slide to a personal and private dimension. Yet, a common sense of life quality: love, peace and humanity. Pictures of their roots and fruits – their families. Pictures of their colleagues and friends. And Nature. Fragments of trivial existence that build a valuable panorama of life. is the leading institution that aims to strength the impact of service design internationally, both in public and private sector. It aggregates an open-minded and knowledge-sharing network of different professionals and believers that get together, discuss and think about new aways to improve the interaction between service providers and customers. Besides all their events, there's a bunch of nice online and print publications, have a look at it on their website. is then about meticulously choreograph a long run, every touchpoint from a service, in detail. Is to build an ecosystem that delivers relevant outcomes by integrating and managing capabilities and services, from people to infrastructures, products and communication, because the design of every component matters to fulfil the needs of the involved participants. A lead that connects people that, one way or another, have a reason and the will to share their thoughts about what/how can design help achieving a better world – equitable, fair, peaceful, safer, reliant, visionary, kind, healthy, pleasing, comfortable, familiar, etc… However, this meetup was not about glorifying us (designers) and the value of design itself as a problem solver, but about sharing fears, questions, strong ideas and lots of open answers. Above all, great concepts aren't always able to initiate and develop the innovative ideas they were meant to, and that's what have been blocking the improvement of many services and experiences. And more than empowering experiences, service design enables saving and generating lives too. It was a great relief to see so many people keen to get their hands dirty and budge those obstacles around! As on every conference, attendees' background, interests, expertise and expectations are diverse, and that creates already a challenge for the organisation itself: how to engage and raise the right discussions? how to provide what people is looking for? And as a service design conference, somehow everyone presumes to get the best conference experience so far. From the day I got to know the event, to the day I bought the ticket and booked my flight, to when I arrived to my hostel or reached the location, to the substance of the talks and the breaks, the food and the mates… all that, till the day I'm writing this post, and the ones that will come – affected by what I experienced during all this journey –, all these matter. The overall experience of the conference was good, but not great. Maybe because I was too obsessed with “service designish” details, or regarding the talks, maybe I expected more concrete deepness about tangible challenges, real practices and failures rather than success theories and unexciting workshops. But again, it's an evidence of how hard is to achieve everyone's ambitions and to overcome their expectations about something. But despite that feeling, interesting speakers and cases came across, from social to business design perspectives, so I would like to remark a few interesting thoughts. shared some lessons about a world where we belong anywhere, how Airbnb community is changing the world by enabling genuine experiences between people. It all started on improving the employees experience. Their internal engagement enabled great customer experience for both hosts and guests, and that has been leading to a massive community engagement which then reflects again on the employees satisfaction. Happy employees <=> happy customers. A full loop of great experiences that inspire the one after. mentioned the impact of service design on loyalty and word of mouth. The way you reach the customers' heart creating memorable experiences. Something relevant, unexpected and authentic, as Walt Disney's dream of exceeding people's expectations over and over again. Surprising and entertaining people was his way of bounding without spending money on advertisement. made her clever point remembering us that we don't need to develop more services and products, but rather, to wisely connect the existing ones in order to reach higher solutions for world wide problems. A design that serves. The right balance between an industrial society and a knowledge society will articulate better systems instead of multiple and duplicated insufficient services. brought up an interesting topic about the trend of not providing a service (no service = self-service), for example the shift from “being taken care of” to “taking care of” (self). The future of healthcare is (already) beyond the hospitals, clinics and doctors boundaries, and getting closer to a self-help approach. Instead of a full professional service, the examination, diagnosis, treatment, monitoring, recovery and maintenance is being brought home. In one side it can decrease anxiety and increase comfort, but fear and confidence are affected too. Services can be hardware based which means they are scripted – limited, linear and predictive, with processes and clear steps towards a specific outcome –, or iterative, fluid, active and responsive, which means they are spontaneous – towards the same outcome, but allowing agility and broader goals, because they are empowered by values (e.g. a call service for health support that turned out to be a “shoulder” for old people that called because they were feeling lonely). reflected about the relation between the qualitative and the quantitative sides of “value”, which for different sectors have different meanings. We all create personal and business relationships where value exists, and within that experience we tend to relate it with professional or personal values, either finance values, sales and revenues, or emotional values, affections and other more spiritual ways of quantitive/qualitative sharing. But the opportunity to build the best value requires us to first understand the qualitative issues that drive decisions, meaning, identity, emotion and satisfaction, and leave the quantitative for a second thought. The way for service design strategically drive premium value into businesses has all to do with triggering the sensorial “state of mind” of business people. proved us the benefits of a “shared value approach”, which basically means a “win-win” of all the players in the entire value chain. The challenges while trying to solve different social problems (e.g. end the sea pollution with fishing nets) acted as an engine for business innovation projects (created a service which generated job opportunities: pick and clean the nets, produce carpets and sell = clean sea, money to improve life quality). elucidated us about a monk life style to argue that there are things we can't design. Karma and experience “can't even be correlated for predictable effect, much less be designed”. Contemporary life runs in a chaotic speed and stress which leads designers to the hard task of rushing with deadlines to simplify and ease what surround us, so Shenyen enquired us about why not to adopt the silence and slow methods of a buddhist monk, and learning to say “no” more often? are often confronted with the others' discomfort of changing things, even towards a better reality. As creatives, designers, or consultants, it's sometimes hard to encourage people to overcome the fear of risking, of failing or lose. Healthcare sector cares about results, not about design, unless that magic does bring actual results, so for that, your deliverables have to clearly impact their decisions and present the profits. Answer their “why”s with research, and their “how”s with strategic visions, designing a change that makes them comfortable to accept and act upon. highlighted the impact of enterprise IT on quality of life with the humanised softwares they structure and design. As we know, the primary purpose of a business software is generally a functional objective: “to track, store or manage data or to support related processes using that data”. So it's impact is limited to what it can accomplish in that specific context, but when its concept pursuits real value for all the roles involved, then enterprise software can affect people's lives differently, from business-centred, to user-centred. shared learnings from his current personal transition into social innovation and made a case for social design as a new and better model for design, particularly service design. In a place with low levels and notions of hygiene it's hard to suddenly change their cultural behaviors. Lots of efforts and understanding are needed to find the better paths to achieve that goal, because there is no system at all, and funcional toilets aren't enough to build a new habit. Long time of thoughts and experiments, the team managed to implement sanitarium facilities, organize waste removal, transport, treatment and reuse as compost because they added value in participation return. Each toilet owner earned for each time it was used, but also had the take care of it, getting the revenue from the waste he returned. Soon, people realized they shouldn't pay for a toilet, but instead make the same profit a have their own to gain from their waste too. Working as an Interaction Designer / User Experience / Service Designer is to be aware of all that and to learn to move from design as a skill set to design as a mindset. To take an active part designing the best experience through engaging and delightful interactions for the users, but more than that, to make them meaningful, to empathize, listen and witness the users' journeys, feelings, actions and reactions. Grasping the information we wouldn't get while embodying them. Re-researching, digging, analyzing and evaluating our findings. Design-think, try, test, fail, retry and rescale to (hopefully) solve all those puzzles and embrace the passion of helping others to improve their quality of life. You will get proud of yourself, at least I do. What's more fascinating, motivating and rewarding than being able to share and apply your knowledge and experience, dedicating your work to benefiting human kind and the world around you? Now, at Liip, we mostly do it through web, but in the near future, we will more and more enhance all different kinds of services, focusing on developing even better customer experiences than the approaches we have done so far.